On the hunt for a “no label” look for your design and packaging, then you’re in luck! The clear BOPP (biaxially oriented polypropylene film) label material is ideal for this type of look as it’s so clear that it allows your brand to speak for itself! We can also reverse print on it, offering a great transparent look, making this material suitable for window stickers for cars, businesses and great for promotional hand-outs. With it’s pristine clear transparency and waterproof properties, showcase your vivid artwork and branding on this clear BOPP material. 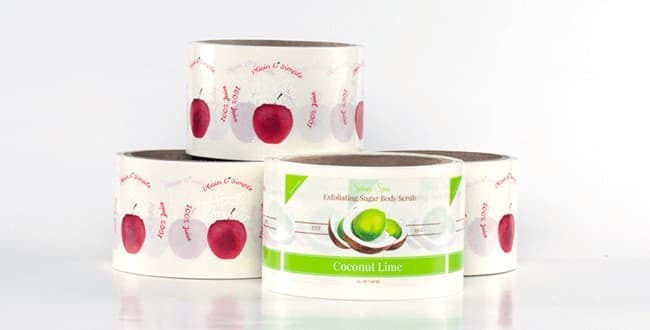 Use this label material in your packaging on bottles or on your health and beauty products, as it works effortlessly with colored containers. What about the resistance of the ink? Our inks are UV cured, which means the ink should not run or wipe off, however if you are at all concerned about such things happening, you can always add a clear laminate to the label, as this will protect the ink from any chemicals, oils or solvents, making it that much more durable and resistant. Or, if you’re going more for an aesthetic, then laminates can offer an unique look and feel to your label. We offer matte, glossy, indoor and outdoor laminate variations.